Gold has played a very sinister role, that of a royal villain, since ages. It was instrumental in a lot of blood thirsty wars, annihilation of many nations and monstrous crimes. Words cannot adequately describe the sorrow and sufferings caused by this beautiful yellow metal. Once, a Phrygian king Midas asked for a boon that whatever he touched should become pure, brilliant gold. When an excellent meal was turned into gold, he realized what a terrible gift he had asked for. Horrified by the prospect of death from thirst and starvation, Midas cried, his arms out stretched to heavens, ‘Have mercy on me, take back your gift’. The history of gold is almost as old as the history of civilization. In Indus valley civilization i.e. in Mohenjodaro and Harappa, gold was used for making jewellery. In Vedas, gold has been named as hiranyamaya. In Kautilya’s Arthshastra, eight different ways have been described by which the goldsmith can steal gold while making jewellery. Before Archimedes, Indians knew how to recognize pure gold and distinguish it from impure gold. They had even standardized the percentage of gold that can be lost while making jewellery. Indian kings used to eat in golden plates, used golden thrones and beds and even temples used a lot of gold. Not only in India, but in other countries too gold has been valued since centuries. Egypt was believed to be quite rich in gold. They used so much of gold that gold sparkled everywhere when the first rays of the sun hit the palaces of kings on the western bank of the river Nile. Even Lydia traded with Greece in gold coins. When Lydia was conquered by the Persian king Cyrus ‘The Gold Coin Age’ started in other countries of the Middle East as well. The Middle Ages saw the flourishing of the al chemistry, which became very popular in transmuting basal metal into gold. Then the search for the Philosopher’s Stone became the target which came to be known as Paras Pathar in India. 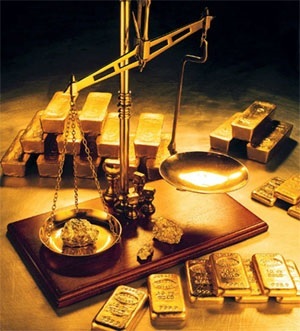 Many countries which had huge deposits of gold were plundered. Khan Batu had amassed enormous amount of gold during his conquest. He ordered two life size figures of horses to be cast, each weighing one and half tones of gold. Similarly, Portuguese and Spanish destroyed the lives of the American red Indians and brought ship loads of gold to Europe. Tons of gold sunk in the sea with ships. Hearing about the presence of gold mines anywhere in the world, thousands of gold diggers used to rush there in what could be called ‘gold fever’. Gold diggers ransacked Brazil, California, the deserts of Australia, South Africa, Alaska and Siberia. In the present times too there is a lot of demand for gold. Now gold digging is fully mechanized. Gigantic machines with automatic devices, remote controls, TV monitors etc are being used. Little more then 50,000 tons of gold have been mined in the entire history of mankind. Geologists believe that earth’s crust alone contains around 100,000 million tons of gold. Apart from that around 10,000 million tons are dissolved in the water of the seas and oceans. The rivers flowing through gold bearing regions wash it out of the rock and take it down to sea. The Subernarekha river of Jharkhand state of India carries some native gold. People collect native gold in small bags from the riverbed thus the name Subernarekha. German scientist Haber tried to extract gold from sea water but found it too costly. Modern technology may turn ocean into an inexhaustible gold mine. Following the footsteps of Haber, French and Russian scientists are trying to develop bio metallurgical process to extract with the help of the gold devouring bacteria and gold sucking mould fungi. In modern times, nuclear physicists have adequately replaced the philosopher’s stone by bombarding iridium, platinum, mercury and thallium by neutron in atomic reactors, scientists to obtain radioactive isotope of gold. Pure gold is very soft and pliant. A gold nugget not longer than a match head can be beaten into a transparent bluish green leaf of 50 square meters or drawn out into a wire more than 3 km long. Pure gold can be scratched by a human nail that is why gold used by jewelers usually has additions of copper, silver, nickel, cadmium, palladium, and other metal making it stronger. A considerable amount of it is lost in dust. 8 tons gold dust was recovered from a rooftop of an old church near a gold coin mint. A clever cashier in a big European bank used to count gold coin on sheets of cloth. He used to take the cloth home and collect dust of gold stuck to it. He was caught after a long time. Gold has an amazing chemical resistance. It is not effected by acids or alkalis. A mixture of nitric acid and HCl called aqua regia, is the only substance that can dissolve gold. Nobel prize winner scientist Neils Bohr made this property in practical use. In 1943 when he had to flee the Nazi occupied Copen Hagen he dissolved his gold noble metal, which he was afraid to have with him, in aqua regia,, hiding the retort in laboratory. When he came back after liberation of Denmark he extracted the gold from it. Gold is often described as the king of metals, highly valued (even by Karl Marx), glorified and gifted, but it is an eternal prisoner. Not a single prisoner in the world is guarded so vigilantly as US gold stock in Fort Knox. There are various other uses of gold. For example, a small amount of gold produced is spent by dentists and jewelers and still less is used for technical purposes. Gold is used in transatlantic telephone cables. Transistors and diodes use gold. Owing to its exceptional chemical resistance gold platinum alloys go into construction of equipment for synthetic fiber plants. In electronic devices commercially pure gold is used with copper as gold seals. These gold seals are used in accelerators of charged particles. Gold is destined to make weighty contribution in exploration of outer space because, gold ensures efficient thermo regulation of the satellite sheathings. In the field of Ayurvedic medicines, Swarna-bhasma i.e. oxide of gold is used in very powerful but costly medicines. Modern scientists may discover some more life strengthening medicines using gold which might make useful contributions to our lives.